You may remember Party Casino as Starluck Casino which first opened its virtual doors in 1997. However, Starluck underwent a rebrand and in 2006, it relaunched at Party Casino, complete with more than 500 immersive and quality games. If you’re looking for a party of a time, this might just be the casino for you, complete with a party atmosphere. Yet, it’s not your run of the mill party by any means, this is one classy casino. The games are powered mostly by Microgaming and NetEnt software and you just know that means a huge range of slots along with table games and a few live dealer options. So, no matter what you like, you’ll find something to suit your gambling style and your bankroll. Party Casino knows how to host its players. There’s excellent customer support, flexible banking options and some nifty bonuses to boot. The casino is fully licensed and regulated by the Gibraltar Gambling Commission and the UK Gambling Commission for completely safe and legal gaming fun. But, that’s merely an overview. Let’s take a look at what Party Casino is all about. All you have to do to take advantage of this welcome bonus and the free spins is sign up and open a real money account at Party Casino. The minimum deposit is just £10, but this promotion is not available if you make your deposits through Skrill, Neteller or Entropay. What’s more, you need to playthrough 35x before you can withdraw any winnings on the bonus. While Party Casino also offers regular promotions, the loyalty programme is worth a mention. You can earn free points every time you place real money bets at the casino. The points help you meet wagering requirements and move up the five levels in the programme. Once you get to VIP status (which is by invite only), you can look forward to benefits like exclusive promotions, faster withdrawal times, higher deposit limits and exclusive invitations to exclusive events. 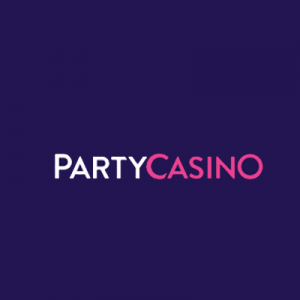 Party Casino is not only powered by NetEnt and Microgaming but you’ll also find a variety of fun games from the likes of Yggdrasil, IGT, Evolution Gaming, WMS, Realistic Games and a few others. It’s a rather unique software set that we’ve yet to come across at any other online casinos. What’s more, you can play the games both on your desktop and your mobile device. Slots fans are well and truly catered for at this casino, with more than 150 titles on offer. There are also 19 jackpot slots which could just see you walk away a millionaire in minutes. The biggest jackpots include Melon Madness, Road Hogs, Going Nuts, The Big One Colossal Cash Jackpot and Loot’en Khamun. The average payout is around £3 million with some prize pools climbing close to the £10 million mark at the time of our review. Slots at this casino are filled to the brim with exciting features. You’ll find a massive selection of TV and move-themed games, all with crystal-clear sound and awesome animations. The fun isn’t all in the slots section, though. There’s a big party to be had with table games, video poker, blackjack, roulette and a few other casuals. In terms of blackjack and roulette, you’ll find a variety of options, with popular variants like standard blackjack and European roulette on offer. As for table games, there’s all the usual suspects along with craps and baccarat. Video poker fans will enjoy 9 different varieties, including Joker Poker, Deuces Wild and Bonus Poker. There are also 10 fun casino games within the games section, including Golden Scarab Keno, Formula Won and Texas Hold’em bonus poker. While Party Casino is mainly a no-download casino, which means you can just login via your browser and play in Instant Play, there is downloadable software, if you prefer. The software comes with the entire menu of games along with a couple of extra features such as entries to special raffle jackpots and access to even more games. Arguably one of the best things about this casino is its live casino section. You can look forward to an array of blackjack, baccarat, roulette and casino hold’em games all played within a live casino setting and streamed flawlessly to your device. That means you can immerse yourself in wagering on the real action at the tables while chatting to the real live dealers. We highly recommend the live Immersive Roulette at Party Casino for its unique use of cameras that bring you a truly cinematic casino experience. Any good party carries on until you are quite ready to stop. The same goes for Party Casino’s dedicated app which means you can take the party with you, wherever you want to. One lucky player even won an incredible £3.5 million playing via this casino’s app. With the app to your smartphone or tablet, you can play some of the best slots around, including Karaoke Party, Space Venture, Thunderstruck, Melon Madness, Siberian Storm, Game of Thrones and Bridesmaids. You don’t even need to download the app, you can play through your device’s web browser. The mobile lobby is nice and simple. You’ll find a neat display of slots and table games, and you can even access the live casino right at your fingertips. The games are all fully optimised for mobile play and are just as attractive and fun as playing on your desktop. If you do want to download the Party Casino mobile app, you’ll find it in the Apple store for iPhone and iPad users. You must have iOS 6.0 or later to run the app. Sadly, there is no dedicated app as yet for Android users. The minimum deposit is just £10. Maximum deposits range from £500 to £75,000 depending on your preferred banking method. The withdrawal times depend on your chosen method, but typically credit and debit cards take around 3 to 5 days with e-wallets being the faster option. Party Casino is played at by gamblers the world over, so it needs all the necessary licenses and certificates. The casino is licensed and regulated by both the Gibraltar Gambling Commission and the UK Gambling Commission. What’s more, it uses a variety of stringent safety measures to ensure complete online safety for your banking and personal information. The casino uses first-in-class 128-bit SSL encryption technology to keep your data safely under virtual lock and key. There’s also a Random Number Generator that regularly tests games for fairness and is certified by the infamous eCOGRA. The site strives to ensure it is deemed totally safe and fair by all the relevant bodies. On top of all that, Party Casino is huge on responsible gambling, and in fact, they take it very seriously indeed. There are a number of tools to help players in this regard, including child protection software so no underage players can gain access to the platform. You can also choose your very own deposit limits, along with whether you’d prefer to take a cool down period self-exclude yourself from gambling at Party Casino. The site also provides a list of Gambling Addiction agencies for your convenience. The party never stops at this casino, and that means there are customer support agents available 24 hours a day, 7 days a week for help in no less than 12 languages. There is the convenient live chat option when you need to contact someone right away, but there’s also a toll-free phone number and an email address. The site also has a clearly laid out FAQ section for standard questions and answers. With this casino having been around for close to twenty years, you just know that it got there by treating its players well, and that means fast, efficient and friendly service whenever you need it. Party Casino is your number one online fun house. This is one exciting operator that appeals to all kinds of players with its large selection of card, table, dice and slot games, not to mention the exceptional live dealer section. On the whole, the website is sleek and stylish, putting you in the party mood from the minute you sign up. The welcome bonus and free spins are a nice touch to get you going, while the loyalty programme is a big winner at this casino. There banking options are bountiful and convenient, along with some impressively high withdrawal limits. What’s more, the mobile app and optimised games give you a truly exceptional change to become a millionaire on the go. We would just like to see a dedicated Android app, too. There aren’t quite as many online casinos out there that offer as many games from so many different software providers as Party Casino. It’s an exceptional mash up of the best brands in the business to make for an unforgettable party. This is one party you need to gate-crash today.